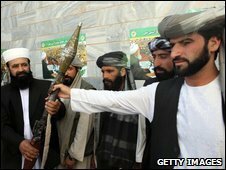 A reconciliation between the Afghan government and some Taliban leaders in the next two years has been proposed by UK officials in a memo seen by the BBC. Reconciliation calls are not new but this would include the so-called Quetta Shura leadership, believed to direct much of the Taliban's activity. Proposed steps put forward in the memo include removing "reconciled Talibs" from the UN sanctions list. The Foreign Office said it would not comment on allegedly leaked documents. Any reconciliation would also include Taliban foot-soldiers and local commanders, the memo said. Several governments are thought to have recommended policies to President Hamid Karzai ahead of his second term. The memo was first reported by the German magazine Stern and by Hasht-e Sobh, a newspaper in Kabul. Two sections of the memo have been passed to the BBC - one looking at regional relations and the other at peace and reintegration. The sections do not include the author or recipient or the exact date, but it is believed to have been passed to the Afghan government within recent weeks. "We must weaken and divide the Taliban if we are to reduce the insurgency to a level that can be managed and contained by the Afghan Security Forces," begins a section headed "Agenda Items 3". "This can be achieved by a combination of military pressure and clear signals that the option of an honourable exit from the fight exists. "Putting in place the right combination of carrot and stick, at the right moment, will be critical to changing the calculations of individual commanders and their men." The memo then calls for an Afghan-led, internationally backed process that works on three levels. Firstly "tactical", involving reintegrating foot soldiers and their immediate commanders. Secondly "operational", involving the reintegration of the Taliban's "shadow governors", senior commanders and their forces. Finally, what is called "strategic". The latter is described as "reconciliation - a settlement with (most of) the Quetta Shura." This is a reference to the council based in the Pakistani city of Quetta, over the border from southern Afghanistan. 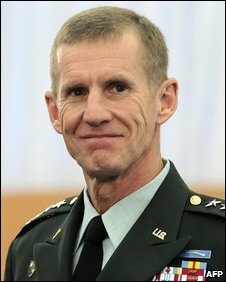 In a report by the US general commanding Nato troops in Afghanistan, Gen Stanley McChrystal, he described the Quetta Shura as the most threatening of a number of insurgent groups operating in Afghanistan. The memo details a series of "action plan priorities" with time-frames attached. Within three months it calls for a "tactical reintegration programme" with a "reintegration tsar", along with international support and funding for the process. Within six months, it calls for alternative political voices to be available to Taliban supporters, for instance through moderate Islamist parties. It also calls for "reconciled Talibs" to be removed from the sanctions list established under UN Security Council Resolution 1267. Within two years, the document calls for a loya jirga - or national assembly - to be held in Kabul, reopening the Afghan constitution and the Bonn agreement of late 2001 which established the current political parameters for the country (a process from which the Taliban was excluded having just been defeated). It also calls for a UN Security Council resolution welcoming the loya jirga and removing the reconciles from the 1267 resolution list, a demand that figures close to the Taliban have been calling for. In July, UK Foreign Secretary David Milliband gave a speech at Nato in which he called the insurgency a "wide but shallow coalition of convenience" and called for a "long-term inclusive political settlement in Afghanistan" involving the drawing away of conservative Pashtun nationalists from those signed up to the ideology of global jihad. But there was no reference in this speech or in recent British government statements to a wider strategic reconciliation between the Afghan government and the Quetta Shura. 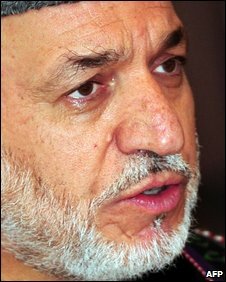 President Karzai has spoken out about the need for talks with the Taliban but he is also known to be suspicious about Britain's intentions. That suspicion was evident when two diplomats, one British and one Irish working for the UN and EU, were expelled in late 2007 for allegedly talking to Taliban groups, talks the men believed were taking place with the full knowledge of the Karzai government. Negotiating with the Taliban is also a challenge because the organisation is far from monolithic. There are significant differences between its operations and alliances in the south and the east of the country. While some parts are under the control of the Quetta Shura and motivated largely by nationalist resistance to foreign forces, other parts are believed to be closer to al-Qaeda and may have been influenced by its global jihadist ideology. The exact balance of power and ideology within the Taliban is crucial to understanding not just whether talks will work but whether the Taliban would be likely to allow al-Qaeda back into any Afghan territory where it regains control.